Computer technology and race steering meet in the C.J.R. Products Dyno. Our Dyno is custom built to test gears, pumps, pitman arms and whole steering systems. Designing world-class race equipment means never accepting “good enough.” That’s why we rigorously test all of our products, both as individual pieces and together in whole steering systems. The steering gear is just like your seat. 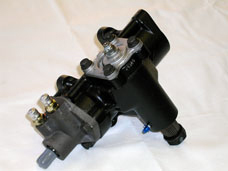 We custom build the steering gear to your feel. To more accurately test a wider range of variables, we custom built our shop Dyno using the latest race steering and computer technology. This precision machine helps us tune your steering gear (and even your entire steering system) to the exact feel and specifications you want. Not only that, but by studying Dyno results, we constantly push our knowledge of race steering into the future. Most important of all, we build every advance we discover into our products — SO YOU CAN WIN MORE RACES!